Each of these medical mysteries, and dozens more, were reported by the legendary medical writer Berton Roueché, who in the 1940s and 1950s wrote the "Annals of Medicine" section of the New Yorker magazine. (The answers are: accidental ingestion of sodium nitrite; dinner cooked with tomatoes crossbred with jimson weed; and a massive daily ingestion of carrots and tomato juice). 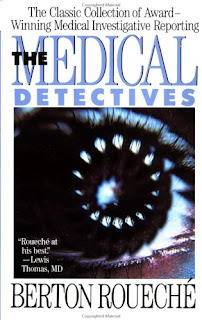 Though many of his 20 or so books or now out of print, Roueché has enjoyed a resurgence of sorts: dozens of the medical mysteries first reported by him have been recycled by the writers of the Fox television show House, M.D.. Though Roueché's articles are exactly the sort of cat-and-mouse epidemiology that are the hallmark of House, it is amusing from time to time to see the 21st-Century doctors struggle to deal with easily-treatable diseases that were much less straightforward in the first half of the 20th century, like trichinosis or leprosy. If the medical science behind House is of interest, skip the mass-market crap capitalizing on the show's popularity. Dig up a copy of one of Roueché's books, and see where the creators of House got all their ideas. If you're not keen on reading wikipedia (or our own ramblings), then why not listen to NPR's 3-part series on Ekman and lie detection via microexpressions? Eldritch: Obligatory webcomic link to parody of Lie to Me. Disclaimer: I haven't actually seen Lie to Me yet; I just thought the comic was funny. I did meet Tim Roth once, though. So I guess that makes me kind of an expert. Pseudonym: Can I tell you how difficult it is to watch that show without expecting him to just suddenly pull a gun on people and start shouting? Cause it is. But, as usual, parodies are funnier with a kernel of truth. Lie To Me has me laughing sometimes at how obvious the actors try to make the expressions that do them in. Like a facial tic becomes a full-blown epileptic fit. It's still a solid show as long as you're willing to accept the science for what it is, not what sells advertising.